Three Republican debates. Three straw polls. Three Hoeber wins. 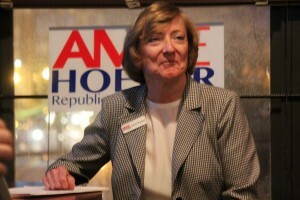 Republican congressional candidate Amie Hoeber won the Frederick County GOP debate straw poll. This win marks Hoeber’s third consecutive straw poll victory. Hoeber first won the Montgomery County GOP Debate straw poll in January and she won the straw poll again in the Washington County Republican Club debate. Frederick County Republican Club President Mark Schaff released the results of the debate straw poll earlier this morning on the Republican Club of Frederick County’s Facebook group page. Below is the official breakdown, as reported by Schaff.